Truck & Driver (TD) is a computer program to track all tows and other services you provide. It also supports Truck Maintenance and Driver Performance tracking and reporting. It is linked to the Accounts Receivable (A/R) and to DATOW, so that information entered into TD can be electronically sent to the other programs and TD may access the other programs' data. TD's Dispatch Screen displays and color codes all calls that are currently active, up to 150. (The system will support up to 30,000 calls before purging is required.) A call may be waiting to be dispatched (displayed as a RED line of information), waiting for 97 (YELLOW) or waiting for 98 (GREEN). An active call may be accessed by using arrow keys to point at it or by entering the CALL NUMBER. When an active call is accessed, its current status determines where the cursor is placed within the call's detail screen. Times are automatically stamped into the call as it progresses. Each call's detail screen contains information about the vehicle to be towed or serviced, locations of the tow (FROM and TO), customer information, call information (TIMES RECEIVED, DISPATCHED, 97, 98), Trouble codes, Dispatcher, Mileage (your truck's odometer), call back Name and number, invoice (driver's ticket) number, financial information (amount of the TOW, MILEAGE, DOLLIES, STAND-BY, etc. ), and more. When a new call is entered, the A/R is checked to ensure that this customer has not exceeded an optional credit limit or been placed on credit hold. The customer's name, telephone number, address, rate structure and comments are also transferred automatically to the call, color coded and displayed. A Dispatch Ticket may be printed at any time for any call. This is useful for those times when a driver is in the office. The dispatcher does not need to orally give the call to the driver. You can just hand it to him! Some customers use this Dispatch Ticket to replace the traditional handwritten call slip or call log. While we recommend that you use Truck & Driver as a "real-time" dispatching aid, you may find that you prefer to use it in an "after- the-fact" way. That is, you may choose to just enter the information into the computer AFTER the driver turns in the tow ticket. No problem. Truck & Driver will work either way. After a call is completed, it may be accessed in various ways, including CALL NUMBER, PLATE or Purchase Order (with our exclusive "SLIDING SEARCH" capability), DATE, CUSTOMER, INVOICE NUMBER, YEAR, MAKE, and other ways. Sometimes you need to retrieve information about a stored vehicle while you are dispatching. Just press one key (we call this a Hot Key) and you can quickly answer a telephone inquiry about a stored vehicle or even release it. No need to stop what you are doing or leave someone on hold. A call may be CANCELED (22'd) at any time. A CANCELED call may be re- activated. Timed calls are also supported. Suppose you get a call for service for next Tuesday. You can enter the call now. Next Tuesday, at the time you specify, that call will start to flash to remind you to dispatch it. The current status for each Truck and each Driver is available at anytime via a hot-key and a pull-down list. This status is automatically updated or can be manually updated. When a driver is assigned to the call, his/her name and 2 telephone numbers (home and page) are displayed. The program remembers which truck each driver used last, and defaults to that truck for each new call assigned to each driver. For a truck, the type and equipment is displayed. Multiple Calls may be created at one time using our Pre-Allocate feature. This is useful for situations where an answering service handles calls after hours or on weekends, and you enter the calls into the computer the next day. A variation of this feature allows you to specify an existing call as a template and duplicate or "clone" that call. This is useful for club operators or for multiple call situations. Extensive reports allow access to call information based on Truck (one or all), Driver (one or all), Income Code (or range), Customer ID (or range), DATE (or range), Status (Posted, Unposted, Both, Canceled) or IN YARD (yes, no, both). Income, Expenses, Repairs and Sceduled Maintenance reports are also available. Most reports can be in either Summary or Detail mode and may be sent to either the screen or a printer. Screen reports can be displayed a line at a time, a page at a time or non-stop. Some reports allow for just totals, if that is all you require. Our ReportView feature allows you to see the detail of an on-screen report item even while you are in the report. Information maintained for each driver includes DL#, SS#, DOB, Hire Date, two telephone numbers and other items pertaining to that driver. Number of Calls handled, Income and Expenses for the current period, the prior period and year-to-date are automatically maintained. Each driver can be assigned two invoice number ranges or "books" that are used to make sure the invoice number assigned to a call is the correct one. You can disable this feature or the dispatcher can override the warning in the event that a driver uses another driver's invoice. Information maintained for each truck includes Plate, VIN, Value, type of equipment and other information useful to your insurance agent. If you enter the truck's odometer reading in a call (an option) its mileage figure is instantly updated in that truck's record. Number of Calls handled, Income and Expenses for the current period, the prior period and year-to-date are automatically maintained. Expenses, both recurring (gas, oil) and non-recurring (transmission, engine, etc.) are easily entered into the system. While not mandatory, this information is useful in determining the cost to operate your company. Scheduled items, such as tune-ups, brakes, etc. are also a part of this system, and can be scheduled by time and/or mileage. A scheduled maintenance report helps you to plan for these events. Many insurance companies offer discounts if a written schedule of maintenance is available. Completed calls may be posted to the Accounts Receivable (A/R) program so that accurate totals of cash received by your drivers in the field and charges to your customers are tracked. This posting may be perfomed either in batch mode at the end of the day, week or month or a completed call may be "Hot Posted" immediately from TD to A/R. This hot-posted call/invoice may also be edited, printed and even marked as paid (with full A/R transaction tracking). When either method of posting is performed, an invoice is generated in the A/R so that all the customer's transactions will appear on the A/R's monthly statement. If an invoice number is entered into the call, that number (usually a driver's tow ticket number) will be used by the A/R. Otherwise the A/R will assign an invoice number to that transaction. A printed report is automatically generated to provide an audit trail. Calls that indicate that the vehicle was stored in your yard are not sent to the A/R. Instead, an option is given to the operator to send these calls to the lot control program -- DATOW. They will go to the A/R from DATOW when the vehicle is released. 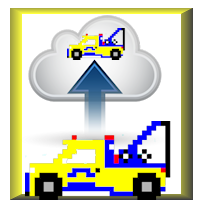 This ability to send Calls to DATOW (lot control) is very useful for tow operations that store vehicles. Information only needs to be entered once, usually during dispatch. When the call completes, the dispatcher can "Hot Post" the call into the yard. Information is instantly available for access should the police or owner call or come to redeem the vehicle. Our "Extended Hot Post" feature allows the operator to easily add information into the lot control program's data that the dispatch program does not -- items such as VINs, Keys, etc. DATOW will then tell TD which LOG # was assigned to that stored vehicle as another cross reference. The hot-post to A/R feature is a handy tool for those tow operators that wish to immediately generate a computer invoice for a service. Some of our clients have found that by sending that invoice, or even an interim statement, to the customer immediately after the service is performed (either via fax or by sending it out with a driver) results in a quick payment. Truck & Driver also supports exporting of data to other programs. Some customers like to use Microsoft's WORD (which is included at no charge in many computers) to create 3 dimensional charts and graphs that show at a glimpse the business you do. Truck & Driver has the ability to warn the dispatcher that the ETA for a call is about to expire. You simply assign that call to a Zone, and if the call has not been 97'd before the ETA for that zone is reached, that call will flash on the screen. Truck & Driver supports Alpha-Numeric pages. With just one keystroke, selected call information is sent to the paging company's computer. The driver now has all the info needed to service the call, without the dispatcher having to read it over the radio and without the driver needing to write it down. Fast, efficient and easy. We even support up to 10 different paging "patterns". That is, you can send different information for a commercial call than you send for a Public Agency call. One keystroke is all it takes. Truck & Driver PROfessional Edition is a multi-user program. The explanations about DATOW's multi-user capabilities apply to TD as well. There is one notable exception. Twice per minute, TD checks to see if any new information has been entered by any other user on the system. This means that more than one person can be entering calls for service or updating call status at the same time, and within thirty seconds that information will appear on all users' screens. When things get busy, this is a very handy capability. We have also found that in many of our installations the owner or manager will have a computer on his/her desk that is "tuned" to the dispatch screen. If too many RED calls are building up and GREEN calls are not getting cleared, it is time to find out what the problem is.